Adaptive optics (AO) measures and then corrects the atmospheric turbulence using a deformable mirror that changes shape 1,000 times per second. Initially, AO relied on the light of a star that was both bright and close to the target celestial object. But there are only enough bright stars to allow AO correction in about one percent of the sky. In response, astronomers developed Laser Guide Star Adaptive Optics using a special-purpose laser to excite sodium atoms that sit in an atmospheric layer 60 miles above Earth. Exciting the atoms in the sodium layers creates an artificial “star” for measuring atmospheric distortions, which allows the AO to produce sharp images of celestial objects positioned nearly anywhere in the sky. CREDIT: W. M. Keck Observatory/Andrew Richard Hara. Nearly two decades after pioneering the technology on large telescopes, W. M. Keck Observatory is once again pushing the boundaries in the field of adaptive optics (AO) after receiving a powerful boost of support. The National Science Foundation (NSF) has awarded the Observatory funding through their Mid-Scale Innovations Program to build a next-generation AO system on the Keck I telescope. 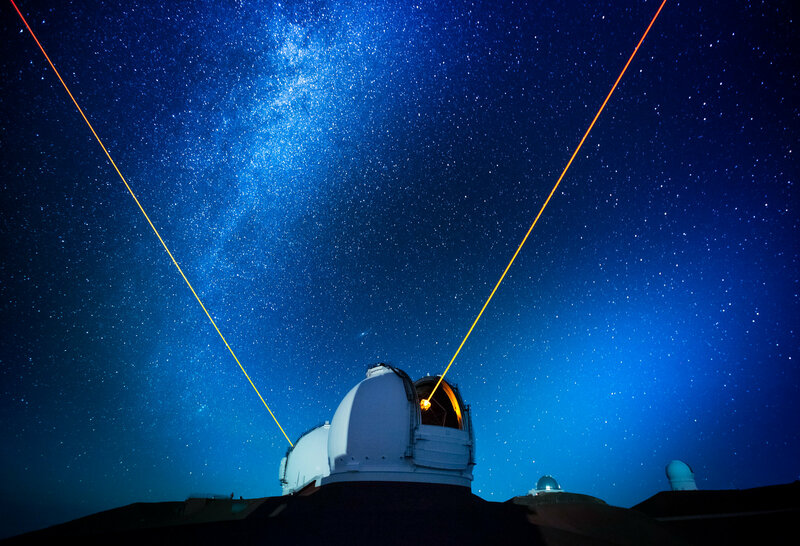 Called Keck All-Sky Precision Adaptive Optics (KAPA), this futuristic technology will deliver significantly sharper images of the universe over nearly 100 percent of the night sky. The KAPA leadership team also includes UC Berkeley Assistant Professor Jessica Lu as Project Scientist and Keck Observatory Senior Engineer Jason Chin as Project Manager. In keeping with Keck Observatory’s guiding principle of sharing important new knowledge, all scientific data will be publicly released to ensure the U.S. community is provided with a valuable scientific legacy. “This revolutionary system will significantly expand Keck Observatory’s scientific reach,” said Co-Principal Investigator Andrea Ghez, director of the UCLA Galactic Center Group. ESO/E-ELT,to be on top of Cerro Armazones in the Atacama Desert of northern Chile. located at the summit of the mountain at an altitude of 3,060 metres (10,040 ft). Next-generation technology like KAPA will require next-generation expertise. As such, the KAPA team is also placing a priority on the broader impact goals of education and workforce development. All students and young researchers will receive mentoring and hands-on work experience. The KAPA team will also launch a new summer school focused on astronomy technology and instrumentation for about 25 undergraduate and graduate students every summer over the course of the five-year project. AO is a technique used to correct the distortion of astronomical images caused by the turbulence in the Earth’s atmosphere. This is done using lasers to create an artificial star anywhere in the sky, fast sensors to measure the atmospheric blurring, and a deformable mirror to correct for it – all done about 1000 times per second. The goal is to study the finest detail possible by largely removing the blurring effect of the atmosphere. It allows ground-based telescopes to match and even exceed the performance of space-based telescopes at much more modest costs. To further improve the clarity of these images, the KAPA project will upgrade the current system by replacing key components: the Keck I laser, the computer that calculates the real-time corrections, and the camera that measures the atmospheric turbulence. The laser beam will be divided into three laser guide stars to fully sample the atmosphere above the telescope using a technique called laser tomography. The project also includes upgrades to a near-infrared tip-tilt sensor to improve sky coverage and a technique called point spread function reconstruction that will optimize the value of the science data obtained with the accompanying science instrument (an integral field spectrograph and imager called OSIRIS). The KAPA project launched in September and is expected to be completed in 2023. W. M. Keck Observatory is a distinguished leader in the field of adaptive optics (AO), a breakthrough technology that removes the distortions caused by the turbulence in the Earth’s atmosphere. Keck Observatory pioneered the astronomical use of both natural guide star (NGS) and laser guide star adaptive optics (LGS AO) on large telescopes and current systems now deliver images three to four times sharper than the Hubble Space Telescope. Keck AO has imaged the four massive planets orbiting the star HR8799, measured the mass of the giant black hole at the center of our Milky Way Galaxy, discovered new supernovae in distant galaxies, and identified the specific stars that were their progenitors. Support for this technology was generously provided by the Bob and Renee Parsons Foundation, Change Happens Foundation, Gordon and Betty Moore Foundation, Heising-Simons Foundation, Mt. Cuba Astronomical Foundation, NASA, NSF, and W. M. Keck Foundation. To advance the frontiers of astronomy and share our discoveries with the world. The W. M. Keck Observatory operates the largest, most scientifically productive telescopes on Earth. The two, 10-meter optical/infrared telescopes on the summit of Mauna Kea on the Island of Hawaii feature a suite of advanced instruments including imagers, multi-object spectrographs, high-resolution spectrographs, integral-field spectrometer and world-leading laser guide star adaptive optics systems. Keck Observatory is a private 501(c) 3 non-profit organization and a scientific partnership of the California Institute of Technology, the University of California and NASA. Today Keck Observatory is supported by both public funding sources and private philanthropy. As a 501(c)3, the organization is managed by the California Association for Research in Astronomy (CARA), whose Board of Directors includes representatives from the California Institute of Technology and the University of California, with liaisons to the board from NASA and the Keck Foundation.